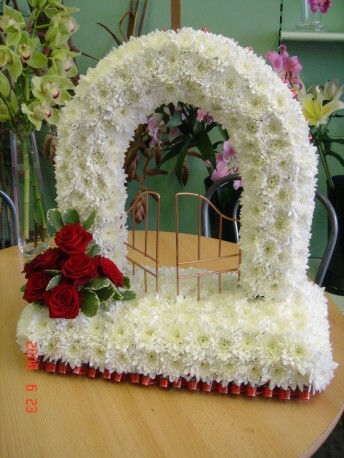 The Gates of Heaven funeral tribute decorated with a ribbon trim, based with white chrysanthemums and a cluster of flowers to match or co-ordinate with the ribboned edge. The trim and cluster colour can be changed to suit your preference, please indicate your choices when placing your order. If you would like to discuss colours changes please call Flowerscene on 01224 712596. Flowerscene are delighted to present this funeral tribute for delivery in Aberdeen and surrounding areas. Same day delivery is often available on orders received by 2pm local time.